Ernest Francis Pedersen was born in Ultimo, NSW, on 13 February 1910, the son of Danish-born Niels Pedersen and his wife Patricia, née Keogh. In 1941 at Glebe, he married Katharine Rosenstein. There was one child of the marriage, Patricia. He died suddenly at Glebe on 8 August 1974, aged 63, survived by his wife and daughter Patricia. Ernest Francis (Ernie) Pedersen was living in Glebe Point when he enlisted in the Royal Australian Air Force (RAAF) on 3 March 1944. He served as Leading Aircraftman with the 2nd Squadron before his discharge on 18 April 1946. Pedersen worked as a storeman at the University of NSW. He was involved with the Miscellaneous Workers Union and later an executive member of the Storemen and Packers’ Union. His interests included politics, American Indian history, travel books, piano and singing. The Toxteth branch of the Labor Party was formed in Glebe in October 1940, taking a big slice of the membership of Glebe branch. Ernie Pedersen emerged as the strong man of Toxteth branch, and he combined branch, union and Glebe Council duties with RAAF service in Borneo and Balikpapan. Later Pedersen’s control was challenged by Bill Beasley with the result Toxteth branch was factionalised and split between Lang and McKell supporters. Ernie Pedersen was appointed government representative on the Board of Directors of Sydney Hospital in 1963 and a Trustee of Wentworth Park Glebe in 1964. He was involved with the establishment of Victoria Park Swimming Pool and was a foundation member of the Glebe Rowing Club. He was concerned for local amenities and suggested light rail transport for the inner city as early as the 1950s. In 1951 the Ernest Pedersen Reserve on the corner of Ferry Road and Avon streets, Glebe, was named in his honour. A recreation centre in Sydney Hospital was also named after him in 1974. He was given the BEM medal in 1969 for community services. Ernest Pedersen was Alderman of Glebe Council from 1941 to 1948 and was the last deputy Mayor before that municipality was amalgamated with Sydney in 1948. Ernie Pedersen was an unsuccessful Federal Labor (Lang) candidate at the 1931 municipal elections. Bill Beasley headed the poll at the 1941 Glebe elections as a McKell candidate, aligned himself with the dominant Glebe team, and was re-elected in 1944 and made Mayor (Pedersen was deputy Mayor). He nominated for the Federal seat of West Sydney in 1945. Pedersen was elected to the Sydney City Council as Alderman for Glebe Ward, 1 December 1950 to 4 December 1953. He was a member of the Finance Committee, 1951–53 and its Vice-Chairman in 1952–53. He belonged to the City Planning and Improvements Committee from 1951–53. 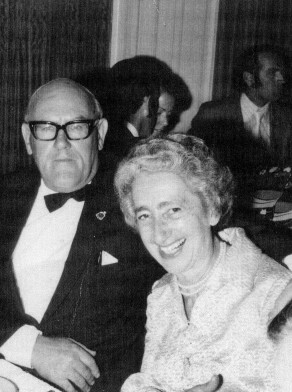 Pedersen was a foundation member of the DLP in NSW in 1956, and an unsuccessful DLP candidate for the City Council.